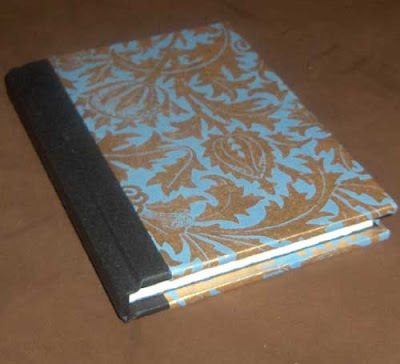 The second book to showcase from this swap, is from Jen, known on Etsy as PaperLion. 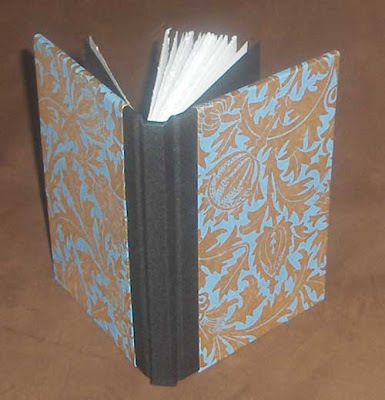 This is a hardcover, case-bound journal with pretty decorative blue and gold paper on the covers and black book cloth on the spine. Black endpapers and lovely white torn pages on the inside really complement the cover design; the combination of papers work really together. Visit PaperLion.Etsy.com to see more of Jen's work. I just got this book and I was so excited when I found it in the mail! Thanks so much paperlion!